Turkish Prime Minister Ahmet Davutoglu has accused forces linked with the Syrian Kurdish YPG militia of the terrorist attack in Ankara on Wednesday. Ankara promised to continue to shell the YPG, with the Syrian Kurds denying all allegations and saying Islamic State is behind the attack. In a live television speech, Prime Minister Davutoglu said Turkey has identified the perpetrator of the Ankara bombing attack as Salih Necer, born in northern Syria's Amuda province in 1992. He added the suspect has links to the Syrian Kurdish YPG militia. Davutoglu added the alleged attacker received assistance from the Kurdistan Workers Party (PKK), which is outlawed by Ankara. Davutoglu said the attack showed the Syrian Kurdish YPG is a terrorist organization and that Turkey expects cooperation from its allies against the group. "In light of information we have obtained, it has been clearly identified that this attack was carried out by the members of a terrorist organization inside Turkey, together with a YPG member individual who had crossed from Syria," Davutoglu said, according to Reuters. “Of the 28 people who lost their lives, 27 are members of the Turkish Armed Forces and one is a civilian,” the PM said, referring to Wednesday attack. 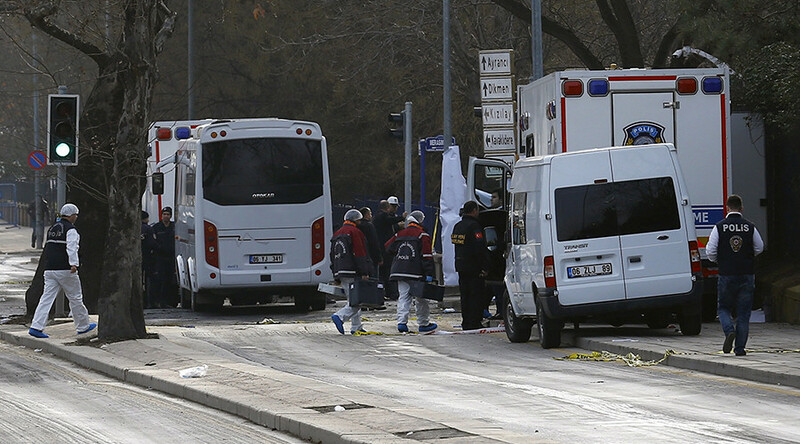 He added that nine people have been detained following the attack in Ankara. Kurdish self-defense forces did not organize the attack in Ankara, Kurdish Democratic Union (PYD) chief Salih Muslim Muhammad told RIA Novosti. He also denied claims that the armed YPG wing was firing into Turkey. "I can assure you that not even one bullet is fired by the YPG into Turkey," Salih Muslim told Reuters. "They don't consider Turkey as an enemy." Turkey has pledged to continue to shell positions of the Syrian Kurdish YPG militia, Prime Minister Ahmet Davutoglu stated on Thursday. Davutoglu claimed Ankara had evidence revealing where the militants came from and how they organized themselves, and that this information would be soon shared with other countries. He also warned other nations against throwing their weight behind “an enemy of Turkey,” saying that this would risk those countries’ status as allies. "Just like Al-Qaeda or Daesh [Arabic pejorative for IS] do not have seats at the table, the YPG, which is a terrorist organization, cannot have one,” he reportedly noted. He also mentioned that senior members of the Kurdistan Workers Party (PKK) had been killed overnight in Turkish airstrikes on their camps in northern Iraq. “If you look at some of the previous attacks, how successful they’ve been, the number of casualties that they’ve had in the recent months, it certainly seems to have a hallmark of Islamic State,” Wagner noted. On Tuesday, at a closed-door meeting, called to discuss recent Turkish shelling of Kurdish YPG militia targets in Syria's north, the UN Security Council urged Ankara to comply with international law in Syria. The UN Security Council received a letter from the Syrian government in which Damascus condemned Turkey’s attacks in the north of the country. Turkish artillery units have been shelling targets in Syria for four days in a row starting February 13, with Ankara highlighting its commitment to stopping the Kurdish Democratic Union Party (PYD) from claiming more territory in the north of the country. They have been pounding Syrian Kurdish forces in an apparent attempt to stop them from taking over the city of Azaz, 30km north-northwest of Aleppo. According to the Russian Ministry of Defense, both government and opposition-held towns over the border from Turkey have fallen under Ankara’s shelling. The attacks have been condemned by the international community, with the UN calling on war parties to end hostilities. The US State Department has called on all sides to avoid escalation of tensions on the Syria-Turkey border. “We have urged the YPG to avoid moves that will heighten tensions with Turkey. But at the same time we have also urged Turkey to cease any artillery… its artillery fire across the border,” State Department spokesperson Mark Toner said on Tuesday. Turkey “sees itself at war with the Kurds internally and now externally in Syria. It is unfortunate because the Kurds are the most effective fighters against ISIS and are de facto allies of the US and Russia,” Professor of Political History at the University of Michigan Ronald G. Suny told RT earlier this week.